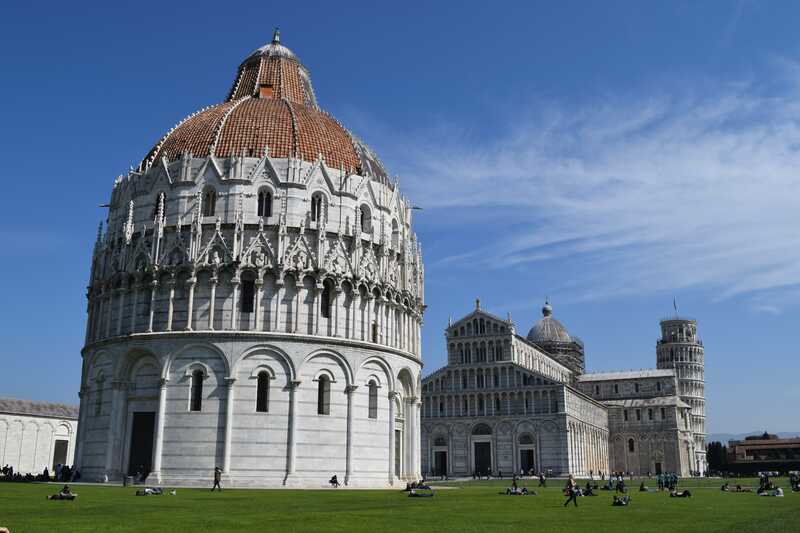 The Field of Miracles is the most popular attraction in Pisa and one of the most famous places in the world. This walled 8.87-hectare area (22 acres) consists of: The Leaning Tower, the Duomo, the Baptistry, and the Monumental Cemetery. 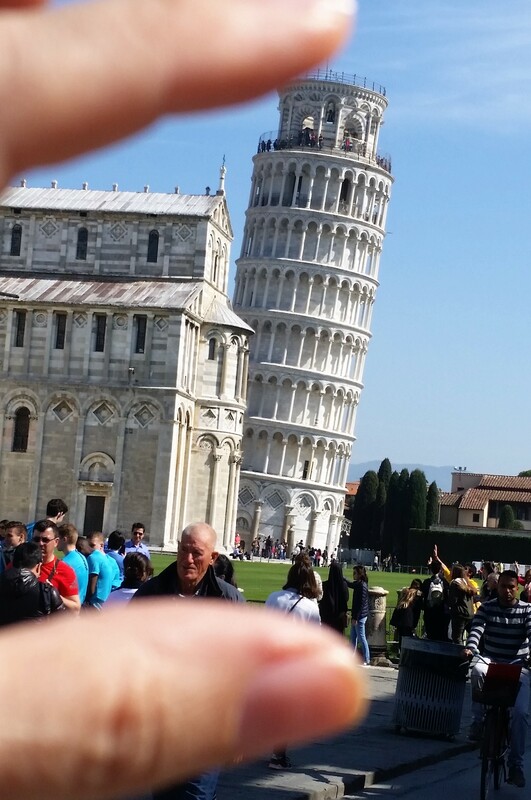 This piazza is called Il Campo dei Miracoli in Italian. This piazza is located at the edge of the old medieval town instead of the city center like most people expect. The tower was built between 1173 and the end of the 14th century. It took so long to build because it started to lean as soon as the third floor was finished and the work halted. A century later the works started again. 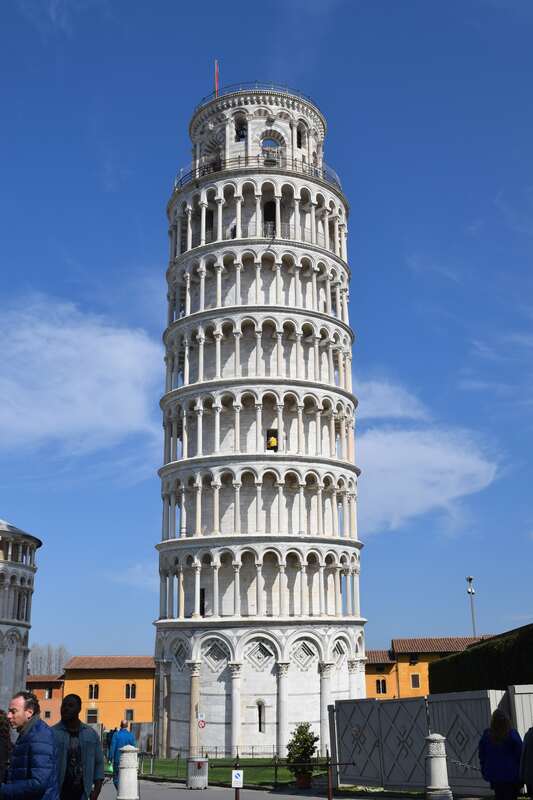 If you look closely at the tower, it is not a straight tower leaning, it is slightly bent, in the attempt to straighten it up and prevent its fall. In the past few years, work has been done and the tower leans less now than it used to five years ago. For several years the tower was closed. The tower now is open and you can climb its 293 steps to the top but it is not possible to go up to the summit without a guide. You also have to purchase the tickets in advance. Meaning, you actually purchase tickets for a certain time and you only have 30-minutes to be in the tower. Yup! Thirty minutes to climb the 293 steps, take your pictures, and return to the base. Security make sure you stay in your time frame. As luck would have it, they were restoring the main alter and part of one of the sides. It was deceiving at first because the screen print actually looks like the fresco but we saw lights through the material. That gave it away! They really did a good job at keeping the scaffolding minimal so you could still admire the surroundings. 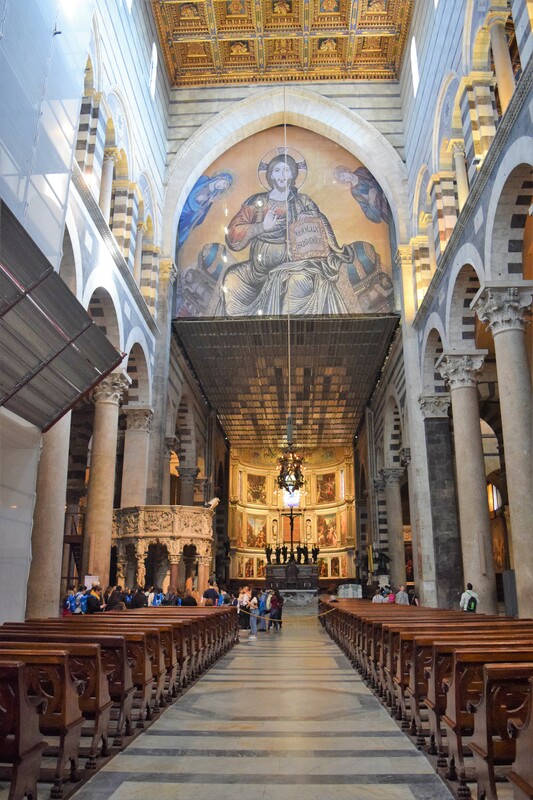 The Baptistery in Pisa has 70 steps up to the top where you can look at the alter from above. It is a plain building with no paintings; almost cold inside. The only real color is from the stain glass windows. The white marble with black striping is just beautiful. Plain and beautiful! What Makes a Church Different From A Cathedral? What makes a church different from a cathedral? Usually behind the alter you will see an imposing seat; this is where the bishop sits during important celebrations. In every town the most important church is called the cathedral because it houses the bishop’s seat. The “cathedra” which is the Latin word for the master’s seat. Always have to take a fun picture too!